Polestar will reveal its new Tesla Model 3 rival in less than two weeks. While the Polestar 2 will make its public debut at the 2019 Geneva Motor Show in March, the automaker’s new electric sedan will be revealed one week earlier in a live online event streamed from the company’s Swedish headquarters on February 27. "The digital format significantly reduces the carbon footprint of the event and supports one of the key benefits of electromobility, to improve air quality,” according to Polestar. Before the big debut, Polestar has released a new teaser image of the 2 showing off its rear styling, which is distinguished from the Polestar 1 with a full-width LED light bar connecting the taillights. A previous teaser image gave us an overhead view of the Polestar 2 previewing its sleek fastback design. While the Polestar 1 was a luxurious hybrid coupe, the 2 will be Polestar’s first ever EV to rival the Tesla Model 3. All of Polestar’s future models will be fully electric, too. To help it compete with the Model 3, the Polestar 2 will be considerably cheaper than the Polestar 1, which starts at $150,000. 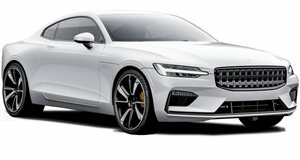 It will be slightly less powerful, however, as Polestar claims the 2’s electric motors will produce 400 hp and offer a very respectable range of 300 miles on a single charge. Hopefully, production won’t be as limited as the Polestar 1, which is restricted to just 500 annual units for three years. An advanced Android infotainment system will also debut in the Polestar 2, which you can try for yourself on your smartphone right now. Eventually, this infotainment system will also be rolled out in future Volvo models. That’s all we know about the Polestar 2 for now, but more details will be revealed in less than two weeks when it makes its world debut on February 27.